Because the L-series access devices connect across standard Ethernet networks, they just snap into place and can be as far away from the shared computer as you like. That gives you ultimate flexibility and ease in setting them up. It also makes it easy to secure the shared PCs behind locked doors. Want your desk space back? We include a VESA-compliant bracket that mounts to the back of most monitors. vSpace creates an independent workspace for each user on the shared computer. Each workspace is a virtual desktop that looks and feels just like it would on a standalone PC. Users interact with their virtual desktop through their L-series access device. And the access device communicates to vSpace via the highly efficient User eXtension Protocol (UXP). Both models are attractive yet unobtrusive at just 1 inch tall and 4.5 inches square. 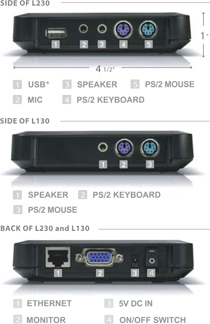 Choose the L230 if you need a USB Flash drive port, 24-bit graphics, or a microphone port. If all of your users are clustered in workgroups and are all close to the shared computers, consider the X-series (lowest cost) or the U-series (add one desktop at a time).